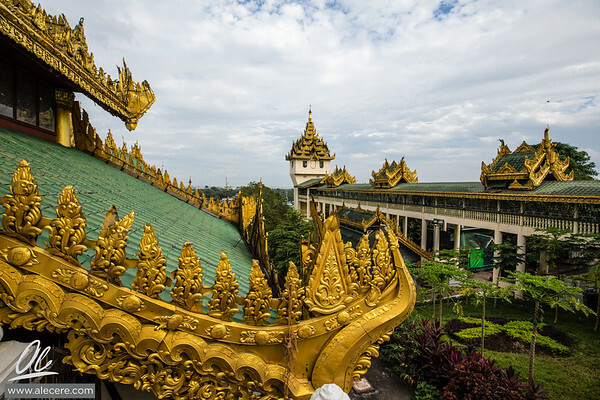 In the soft light of an overcast day, the glitter of these roof is bright and distinctive. 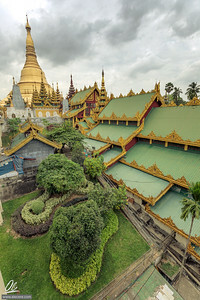 Roofs and gardens of the Shwedagon Pagoda in Yangon. Big temples, lots of people working in it. 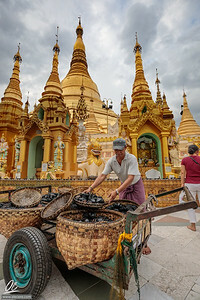 Here, they are preparing the oil lamps for light offerings to Shwedagon pagoda. 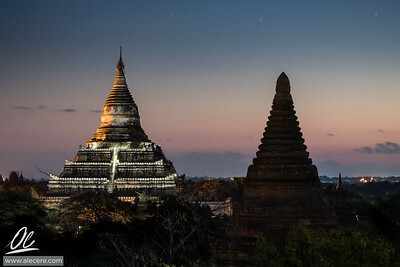 Shwedagon Pagoda is the most sacred Buddhist pagoda in Myanmar, as it is believed to contain relics of the four previous Buddhas of the present kalpa. 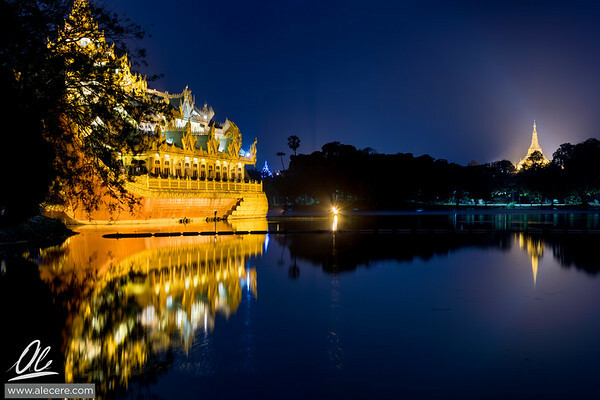 Karaweik Palace and Shwedagon pagoda at night. 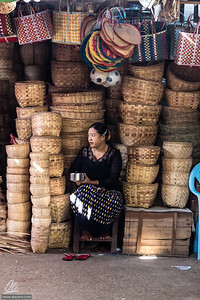 Early in the morning, before the crowds of local and tourists arrive, this seller enjoys a quick breakfast while guarding her merchandise. 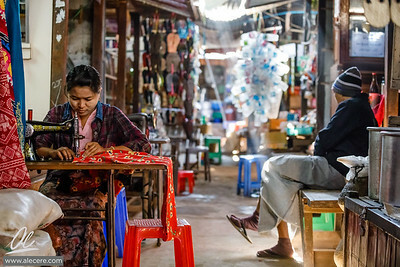 Early in the morning, it is still possible to get a glimpse of the Ma Ni Sithu market market before the mass of tourists arrive. Few precious moments, worth the early wake up. A group of novice nuns from a nearby monastery collect alms in the early morning. 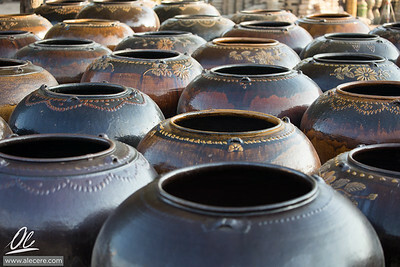 On their shaved head there's the support that will help keep the large collection bowls balanced on top of their head. 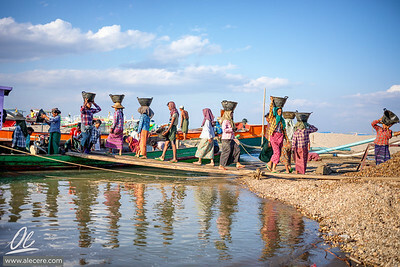 A group of porters, mostly women, unloads gravel from a barge to the shore, where it will be loaded onto trucks and used for paving new roads. 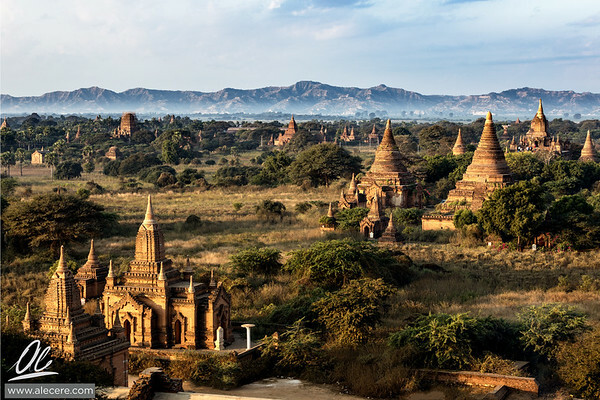 In this part of the world, a lot of heavy work is still done without machines. 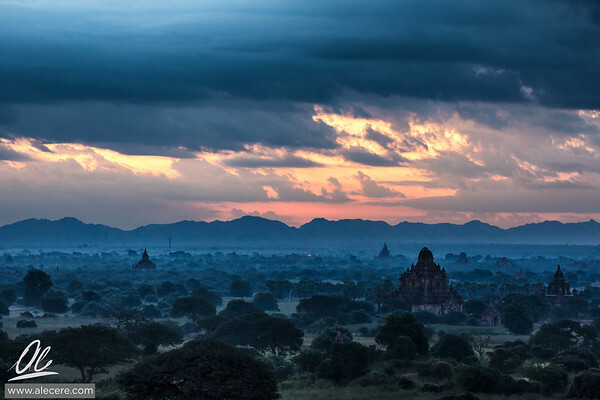 A view of the Bagan Archaeological Zone at sunrise. 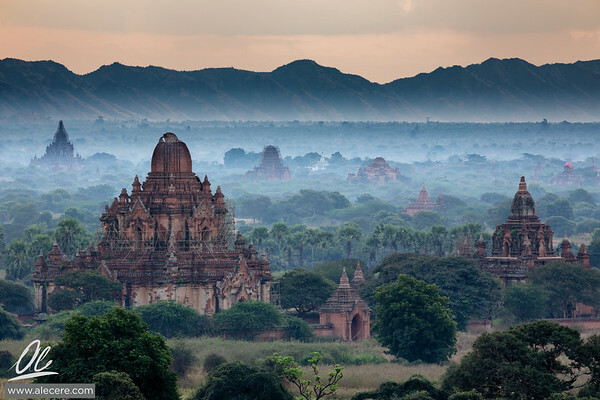 View of the archeological area of Bagan at sunrise. 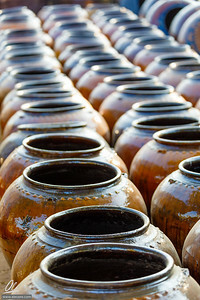 Large clay pots are used to store waters during the dry season. 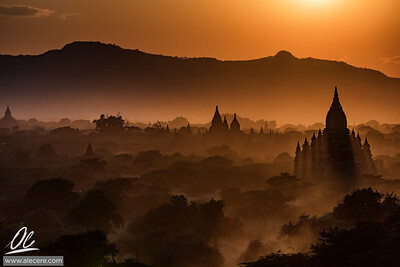 Sunrise over the archeological are of Bagan, Myanmar. The slowly rising fog creates a beautiful glow. Sometimes it is worth to look on the opposite direction than the rest of the crowd. 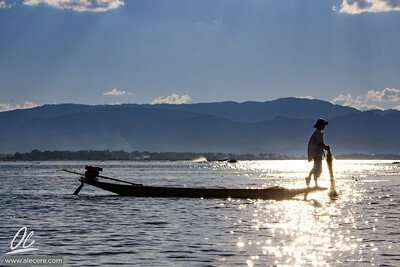 A fisherman casts his net in the waters of Inle lake. 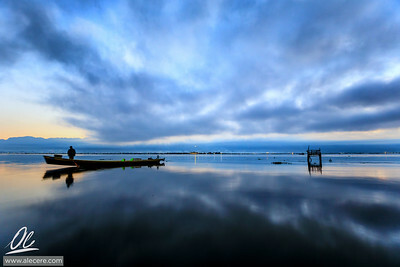 Fisherman start before the sun rises and continue well after sunset. 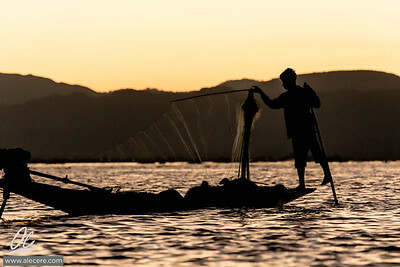 The characteristic leg paddling of the fishermen of Inle lake. 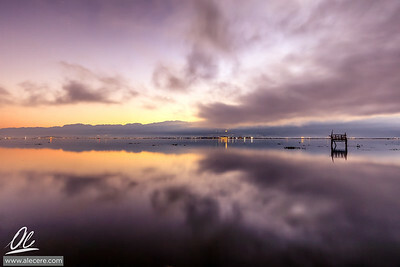 This unusual technique allows the fishermen an elevated point of view, essential when navigating the shallow waters of this lake. The morning stillness is broken by the first boats carrying goods, tourists, and fisherman. 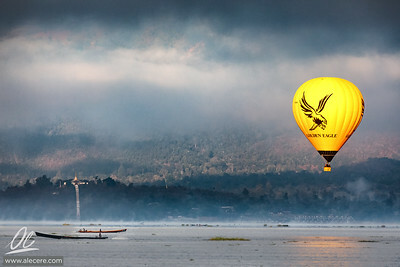 At sunrise, it is possible to fly over the Inle lake on hot air baloons, and observe from a vantage point of view how the first rays of sun light up the mountains and the gilded pagodas. 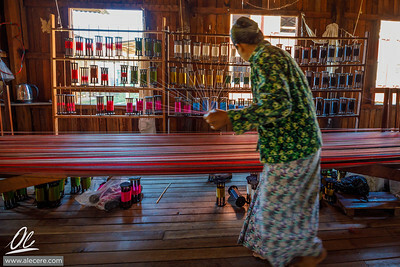 Lotus silk threads of multiple colors are being selected to be included in the next textile work.